Don't buy from a team that won't play in GW28. Try and buy from a team that scores lots of goals. Try and buy from a team that has good(ish) upcoming games. Purchase someone that is likely to start & capable of scoring/creating. The criteria above led me to buy Sturridge and Rodriguez. I know it's a risk doubling up on 2 strikers from the same team in Suarez & Sturridge. But the "SAS" partnership has been amazing thus far and I can't help but think that either they will both do well or at the very least one of them will per game. As for Rodriguez, he has been a bit of a dark horse this season. Both Sturridge and Rodriguez will be looking to make England's World Cup team in Brazil. What better way to do that by playing well from now until May? In #FPL terms they are both value for money, scoring 22 goals between them (a combined goals:minutes average of 1 per every 133 minutes). West Brom at home will be a tough team to beat, but Liverpool will be an even tougher team to prevent scoring! With this in mind, I could have captain Suarez or Sturridge, but have opted to give the armband to the Uruguayan. Looking at my team, I actually like how it looks now than to 48 hours ago due to the balanced attacking options. Let's hope it works out! Hasn't kept a clean sheet since 14th December 2013. Due to face a United team that includes Mata, Van Persie & Rooney. Despite only losing two PL games at home this season, they stand no chance v Utd. Still looking to secure a World Cup spot in England's squad. Facing a Fulham team that concedes 2 goals at home on average. With no Osvaldo, Rodriguez should flourish & potentially score even more. Suarez has a knack of scoring goals as well as creating them. "SAS" partnership has made Liverpool the 2nd best scoring team in the league. NEWCASTLE & SUNDERLAND TO DRAW (2-2). WEST HAM TO BEAT SWANSEA (2-1). CARDIFF TO BEAT NORWICH (1-0). SOUTHAMPTON TO BEAT FULHAM (2-1). MAN UTD TO BEAT STOKE (3-1). LIVERPOOL TO BEAT WEST BROM (3-1). ARSENAL TO BEAT CRYSTAL PALACE (2-0). MAN CITY TO BEAT CHELSEA (2-1). To tell you the truth, if it wasn't for this self imposed limitation (#CalledIt picks can't be repeated over the course of three GWs) Santi Cazorla would have been made my pick. On form, has scored three goals in the last two games and still owned by only 3.5% of FPL managers. At the same time, he has two VERY tough match-ups following the home game versus Crystal Palace (a match-up that probably looks better on paper than in real-life). A possibly great 1 GW differential. David Silva, despite going against Chelsea, should be involved in the play if City manage to score a goal or two, so I would gladly give him the call - yet he is now owned by 5.1% of managers. This 0.1% makes him ineligible, which makes me go Aaaaaaargghhhhhhhh! Another potential great option would be Kevin Mirallas who is set to lead the attack following the injury of the big Belgian and was very lively against Liverpool as well, as one of the few. Would make a great pick, but also just over with 6.8% ownership. With all this in mind, I have decided to turn to a team that is also scoring goals with ease (less than MCFC mind you, but still not bad), Liverpool. Somewhat of an underperformer this year, he has all the prerequisites to be an amazing FPL asset, but has just failed to click yet. Why not this week? 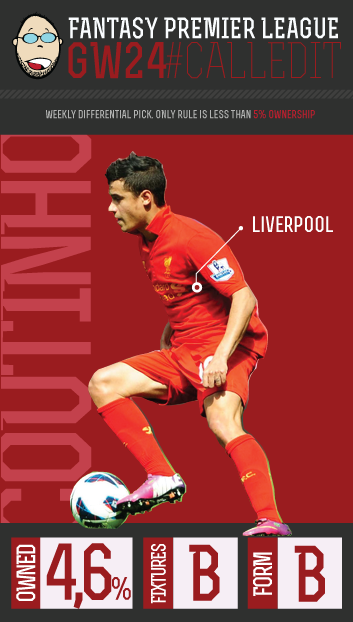 #CalledIt pick for GW24, Phillippe Coutinho. He had 2 shots on goal against Everton and also created 4 chances, with one being an assist out of those. P.S. Can you imagine that even Ben Arfa is owned by more than 7% of managers? There are slim pickin's this week at the bottom of the table. Although Hull, Stoke, West Brom and Fulham all have home fixtures, they will be hosting Tottenham, Manchester United, Liverpool and Southampton respectively. Crystal Palace will be visiting Arsenal so I'll be leaving that fixture alone as well. That leaves Cardiff, (who host Norwich), Sunderland (who are away at Newcastle), and West Ham (who host Swansea). I have yet to see Swansea impress me with their defence in the games I've watched them play this year, so I'm looking to the bearded wonder to break them down when the Swans come visiting. With an ownership level of only 0.3%, Carroll provides great differential potential not only for this week but as a viable option going forward. With differentials at a premium at this point of the season, I see Carroll as someone that people will be looking at closely as they try to gain ground on their mini-league leaders. If he bags one or two in the coming weeks, we all may have another mini bandwagon on our hands. Good luck in Gameweek 24 everyone....and Happy Deadline Day!! Another decent #FlyBuy pick last week kept the run going. Mata got off and running in a Utd shirt and picked up an assist in a decent debut to rack up 6 points. Not really a total shock, as with his class it was not going to take long for him to "fly" again. This weeks pick is also another no-brainer. Sometimes these players pick themselves for FlyBuy. I'm going to go with him because I don't think I'll be able to go for players from this team for much longer. The parameters of FlyBuy dictate that I must pick from a team situated between 5th and 15th in the table and I predict it will only be another couple of weeks before his team are out of reach for me. Also, it must be a player who I predict to "fly" again. Maybe a loss of form or a return from injury has seen them not pick up the points expected of them. A disappointing season by his high standards. Rumours of a clash with the manager refuse to go away, but boy, how they've missed him up front during his 10 game lay-off through injury. He did return briefly in GW15 and played 90 minutes before disappearing again. I think this figure is likely to explode and go nuclear with the news of the injury to Aguero and although he is the highest priced player in the game, he will almost definitely be a must-have for the rest of the season if he stays fit and repeats his heroics of last year. 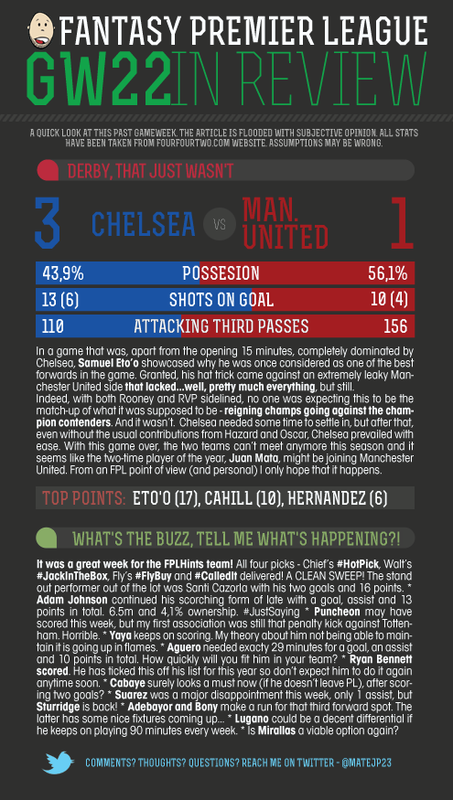 Looking back at Gameweek 23 - Chief's "LESSLINES"
IT DID MATA FOR UTD! JUAN & RVP INSPIRE REDS TO A HOME WIN. TAXI FOR CAB AS CANARIES & MAGPIES PLAY OUT A HEATED 0-0 DRAW. ARSENAL DROP POINTS AWAY AGAINST A RESILIENT SAINTS TEAM. CHICO TIMES IT RIGHT WITH SHELVEY BAGGING THE WINNER FOR SWANS. PULIS'S EAGLES CONTINUE TO SOAR WITH A TYPICAL 1-0 WIN V TIGERS. REDS RUN AMOK IN MERSEYSIDE DERBY WITH THEIR "SAS" STYLE FINISHING. BENTEKE BANGS HOME THE WINNER AS VILLA WIN A 7 GOAL THRILLER! ALLARDYCE PARKS HIS BUS JUST RIGHT AS HAMMERS HALT CHELSEA'S RUN. JOHNSON'S JOLLY FORM CONTINUES WITH BLACK CATS PIPPING STOKE. 5 STAR CITY CRUSH SPURS AT THE LANE AND CLAIM TOP SPOT IN THE PROCESS. DIDN'T YOU LISTEN BEFORE FELLA? EH? JUST CAPTAIN SUAREZ! OUCH IF YOU HAD ROSE, REMY, B.JOHNSON OR FLAMINI - MARCHING ORDERS. USE THAT JANUARY WILDCARD BEFORE IT EXPIRES! *"LESSLINES" is a portmanteau of Lessons and Headlines. They are intended to be bite-sized summations of what we learnt during the Gameweek! Fantasy Football, and indeed Fantasy games in general, are growing year on year in the UK and Ireland. This popular trend industry is still some way behind its American cousins where over 30 million fantasy fanatics play each season but the numbers playing are increasing each season. 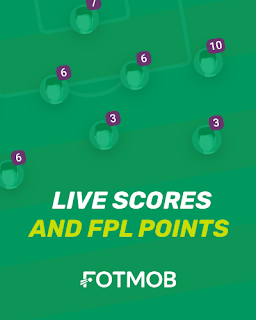 There are currently over 3 million people making topping leagues, propping up leagues, making transfers and playing wildcards each week. Fans of twitter will be familiar with the hashtags #fantasyfootball & #fantasyfootballproblems, both of which are very popular. Given the numbers involved not everyone can be a winner and not everyone can be in content week in / week out. For every 100 points weekend there are ten 22 pointers. It can hard and that’s without throwing in jobs, girlfriends, wives, kids and families. Here at www.fantasy5live.com we’ve come up with a solution to compliment your love of fantasy football, think of us as the salt & vinegar to your chips, the laces to your shoes, the.. Well, you get the idea. It’s a simple pick 5 format based on individual games. 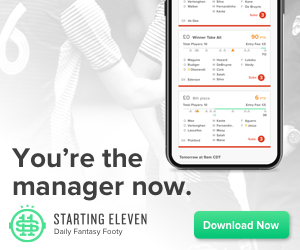 Just log on to www.fantasy5live.com, pick a game (Don’t panic we cover lots of sports but football is in there) and select the five players you think will make an impact - (Any five, if you think goals go for forwards, if you think clean sheets plump for defenders or mix and match). The scoring format is similar to the everyday league but with higher points. It’s fun. We engage with our users on twitter @Fantasy5live.com and each game we have a prize, guaranteed. Our next game is Liverpool versus Everton so check it out. Well, this fixture has the most red cards (20) than any other game in EPL history, so might want to watch out for tough tackling midfielders/defenders. It has goals, only one clean sheet in the last 16 games. It has fearsome strikers, Romelu Lukaku has scored 4 goals in his last four games against Liverpool while Luis Suarez has scored 3 goals in four derby games. Registration is free, just go to www.fantasy5live.com and sign up. Tonight’s game is sponsored by classic11.com so you could win a £20 voucher, but if not you can always try again. More goals than apps so far. Partnership with Sturridge benefits both. Expect more goals! Spurs' attacking engine. His fine form of late shows why AVB bought him in the summer. A cheap defender with attacking prowess. Ideal for rare apps & stock sub 3 usage. The Iberian foil that supports Aguero. Silva is due more goals/assists & is cheaper than Y. Toure. Sunderland have found some form. Mannone is cheap and rotates well with Marshall. Hasn't been too bad when playing at home. He rotates well with Mannone (as shown above). Swans are due a clean sheet. They have good upcoming games. Davies has attacking prowess. Irons lack form but are due a clean sheet or two. He is cheap & alternates well with my team. Listed as a defender but has recently played in midfield (OOP status). Pulis's Palace can defend. Good price for a Top 6 team defender. Won't score at all but will keep occasional clean sheets. Chelsea's top goal scorer. Dominates their midfield & overshadows strikers. Must have. Has a fantastic record in the PL. Is more than capable of scoring & helping United to 4th spot. Classy & cheap, but a temporary purchase. I will replace him with Zaha before the start of GW24. Playing for a team that has scored 100+ goals already. Title challenge will also motivate him. Cheap forward option. With Long gone and Anelka possibly suspended he could shine. Too expensive for my liking. It made sense to reinvest funds elsewhere in my team. Was a short term purchase who then acted as a stock player. Didn't make sense to retain him. Served a short term purpose to my team. His injury was unfortunate. His injury and excessive ownership were factors. Offset by me buying Distin instead. Arsenal don't have too many good upcoming games. His sale allowed me to bolster midfield. Served a purpose of keeping some home clean sheets. Has tricky upcoming games. Re-buying him was a mistake. Arsenal's inflated midfield may affect his attacking prowess. Has shown his promise earlier in the season. Worth reconsidering after retaining 100% fitness. He is good. But I think Gerrard, Coutinho, Suarez & Sturridge will affect his future FPL pts tallies. Has been on form & is cheap, but Aguero will outdo him on presence and goals. His form has been hot & cold recently. I couldn't afford to keep him any longer. Almost perfect rotation up until the time I will probably use my all-season wildcard. Not an area of strength per se (Distin & Davies are bonuses), but I only intend to use 3 at a time so I am not entirely bothered. On paper - 5 phenomenal picks. I will be disappointed if they don't score a big chunk of my average GW points. 3 big names would have been ideal. But I can't really complain when I have Suarez & Aguero slotted in! You can modify your teams up until 7.30pm GMT on 28th January. Kick off occurs at 7.45pm. Team sheets should be announced by 7pm. In theory, you can modify your team by knowing Tuesday's starting line ups in advance, albeit for a short period. Each season I aspire to better my overall rank from the previous season (Currently Top 0.2%). Unfortunately due to my abysmal current rank of 122k that seems out of reach this year. As a result, I have decided to revise my objectives and at the very least aim for a Top 1% rank. This means that I aim to finish higher than 31,587. In addition, I am looking to score 80+ at least half a dozen times between now and the end of the season. A couple of tons would be perfect and not beyond my reach, thus I am in pursuit of them too. As for league positioning, I aim to win my public leagues and hopefully have some Top 3 finishes in my private leagues. A player who may be out of form, returning from injury or who just hasn't been performing - but who has the potential to "fly" again. You've got it now haven't you? There's is ONLY one player it can be! Juan Mata! Come on down! The price is right! Well, £37.1m is pretty hefty, but it's only a couple of million more than Liverpool paid for Andy Carroll so let's put it into some perspective. The good news for you, is that he will only cost you a fraction of that to bring him into your FPL team. £9.4m to be exact. But be warned, although his ownership stat is only at 6.3% at the moment, this is going to rise - and rise quickly - if he gets off to a flyer. Over 89,000 managers have brought him in this round already. The downside is it is unlikely he will play more than a bit part against Cardiff in GW23. But #FlyBuy isn't all about just one week - it has more longevity than that. You should be looking at the potential for a FlyBuy pick to go on a run. Recent picks have done just that; Leighton Baines in GW21 and Wilfried Bony in GW22. Just check out how popular Bony has become since I tipped him! Not that I can claim credit for THAT particular bandwagon! So, get on Mata now. He is the epitome of all that FlyBuy represents. It almost doesn't need saying that this is a player who will DEFINITELY recapture his form of old and fly high once more. Make sure you check out the embedded video. It's worth a watch I promise! It has come to this - I have created my very own, #FPL-centric Twitter handle. Yes, I know, you must be thinking to yourself: "Oh lord, not ANOTHER FPL account!". If you asked me half a year ago...scratch that, 1 month ago, if I wanted to create an FPL account, my answer would be something in the lines of "Are you insane?". Honestly speaking, god knows that the world doesn't need yet another FPL account. However, my friends and some people who do not follow me because of FPL (Huh? There are people like that? ;) ) have told me that I am annoying a bit at times with all the fantasy football communication. So I decided to oblige them and create a new account - @CalledItFPL. Effectively, this means that as of GW24 I will move the communication related to FPL to my new handle, so make sure you are following it in case you want your daily/weekly dose of FPL from my side. That's it! In the 24 hours since its' inception, I already have 333 followers - Thank You in case you are already one of them, if not, looking forward to you joining! 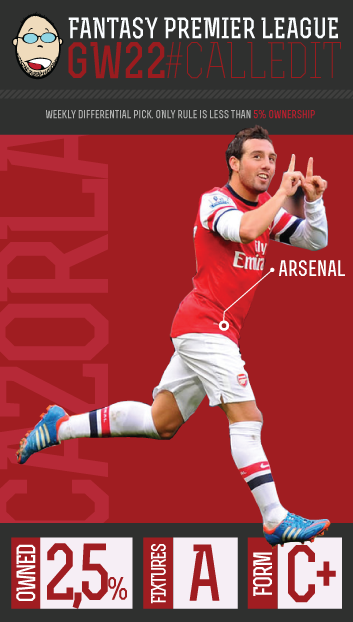 To start things off, Santi Cazorla proved to be a great #CalledIt pick in GW22 with two goals and 16 points alltogether. I hope you seized your chance and improved your overall and mini-league positions. But, as a wise man once said: "Don't congratulate yourself too much. Or berate yourself either." With that in mind, let's move on quickly. This week, I am (again) presented with the abundancy of choices for the #CalledIt differential pick. The matchups that have me thinking are CHE vs WHU, SUN vs STO and SWA vs FUL. And the options? No surprise, after his hat trick in GW22 (and injury to Torres), Samuel Eto'o could potentially be even captain material as Chelsea will be looking to dismantle West Ham. 8.2m and 1.5% ownership make him a great differential. His midweek performance was less than stellar and with Mourinho, who knows who will be starting as the lone forward, so I will look the other way. If you, for some reason, need a differential that no one will have, then he is your man. Adam Johnson? His three goals and an assist against Fulham didn't impress me enough to consider him as a viable long (or mid) term option. But then he goes and follows that up with a goal and an assist against Southampton. Errrm, really? While I still don't consider him as a viable long-term option (I know, weird old me), he may be a good option this week. 6.6m and 4.9% ownership. Instead, I am going with Wilfried Bony. Despite Swansea's woes and relegation-fear form, he seems to be in great form lately with three goals in the last three GWs (and 3 in the Cup). And they play Fulham. At home. Midfield problems? Yes. But Bony can deliver out of nothing. We've seen that. I am taking a punt on him as #CalledIt pick for GW23 AND putting him in my Wildcard team. Well these weekly JackInTheBox picks are getting both easier and harder. Easier in that the relaxed parameters give me access to the bottom 8 squads in the EPL table and the bottom 8 FINALLY include a couple of squads worthy of a second look and/or a couple of players in decent form who also fit the ownership threshold. Happy days are here again! Harder too though, in that I have always wanted to shy away from players already picked by my teammates for fear of "copying" a pick or piggybacking off a successful pick of someone else's. Sometimes I have to fight off my own stubbornness though and realize that the pickings are slim at the JackInTheBox end of the table, and this week, I'm not even considering anyone other than two players who have been in good form, are blessed with good fixtures this week, and surprisingly are still owned by fewer than 5% of #FPL managers. Here's to a good week for all of you WildCarders out there! Speaking of Wildcards, make sure you check out Chief's article where he unveils his Wildcard team for GW23. It should be coming out shortly and will surely be one you'll want to read. He has only kept 1 clean sheet in 4 PL starts. Facing a Chelsea team that has scored more than 2 goals on average at home. West Ham could score a goal, but I would expect them to easily concede more than 1. Was Chelsea's player of the season for two consecutive seasons. Scored 17 & assisted 34 goals since August 2011 in the Premier League. I believe Mata is the signing of the season and he will help United secure 4th spot. Scored 9 & assisted 8 goals in 22 PL games this season. Facing a West Ham team that is conceding more than 1 goal per away game. Most of Chelsea's goals have been scored by their midfield: Hazard is the top scorer. MAN UNITED TO BEAT CARDIFF (2-0). NORWICH & NEWCASTLE TO DRAW (1-1). SOUTHAMPTON & ARSENAL TO DRAW (1-1). SWANSEA TO BEAT FULHAM (2-0). CRYSTAL PALACE TO BEAT HULL (1-0). LIVERPOOL & EVERTON TO DRAW (2-2). ASTON VILLA TO BEAT WEST BROM (2-1). CHELSEA TO BEAT WEST HAM (2-0). SUNDERLAND TO BEAT STOKE (2-1). MAN CITY TO BEAT TOTTENHAM (2-1). I sure hope not. In baseball, strike three means you're out. Adios. And I am having none of that. Having said that, I think a base hit (an assist) is within grasp for sure, while a home run (a goal) would be nice to re-establish #CalledIt as a credible differential pick. Anyway, Arsenal are playing host to the lowly Fulham on Saturday and if Sunderland (yes, Sunderland) were able to put 4 past them, then I see no reason why current league leaders couldn't do the same. While the majority of Walcott owners turned to Özil as a replacement, there were some who took a gamble and got Santi. Bold. I sincerely hope come Saturday afternoon we will see the Santi from last year's. You know, like the guy scoring a hat trick versus Reading? Yeah, that guy. Santi Cazorla, #CalledIt pick for GW22. P.S. As added assurance, whenever the selected player was pointing to my #CalledIt on the visual, he delivered. I made an effort to search for such a picture. Success is all but guaranteed. My #FlyBuy pick for GW21 paid off big time for those of you who had him in your team. Unfortunately I was not one of them, so didn't benefit from the assist, clean sheet and 3 bonus points that Everton defender Leighton Baines delivered. So onto GW22 and how to keep the run going! Easier said than done, but after a lot of thought I've opted for a guy who I was eager to see in the Premier League when he was signed last Summer. After a goal scoring debut, his league form has never captured the decent return he has made in this seasons cup competitions. Disappointingly, he has only provided double figure points returns in two Gameweeks all season. Not the kind of stats that would encourage you to put him in your team. However, two goals against Manchester City certainly caused me to sit up and take note, and include him in my watchlist. This week his side face Tottenham at home, but I see no reason why - with his power and strength - he cannot get on the score sheet. With an ownership percentage of 3.4% and with his team currently sitting in 13th position, he fits the parameters for FlyBuy, and that is why my recommendation to you this week is Swansea City forward Wilfried Bony. With creative force Michu due to return in the next couple of weeks from injury, I predict these two will prove to be a dynamic duo with the ability to propel Swansea higher in the table and finish the season on a high. I can't remember the last time I had a successful #JackInTheBox pick but I know it was too long ago. Thinking too hard and trying too hard is getting me nowhere so I'm taking a different approach this week. My most successful pick ever was made on gut instinct so the heck with it, I'm gonna try and conjure up a good call using nothing but my gut again this week. The 8 teams qualifying for #JackInTheBox consideration this gameweek are Crystal Palace, Sunderland, Cardiff City, West Ham, Fulham, Norwich, West Brom and Swansea. For me this week it's simple; I'm rocking Julian Speroni in goal on my #FPL team for the time being, I want Palace to do well and think they have a chance of keeping Stoke out of the net, despite the recent scoring spree against Liverpool. I'm not picking Speroni though; I'd rather pick someone who, although a defender, still has the possibility of scoring even if they concede. I'm going with Joel Ward this week. For the past few weeks he's spent some time playing in the midfield, which could mean some good FPL points if he continues to spend time with assist-potential in the midfield while still classified as a defender for FPL purposes. Snagging a clean sheet along with an assist or even a cheeky goal will do wonders for my future-telling confidence as well as give me a much-needed boost in my overall season stats. So there you have it; this week's #JackInTheBox pick; Joel Ward of Crystal Palace. Good luck Joel; I'm counting on you, brotha. Good luck this gameweek everyone - using that Wildcard or holding on tight? Looking back at Gameweek 20 - Chief's "LESSLINES"